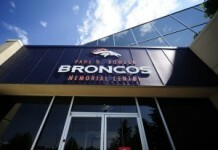 Broncos season is rapidly approaching, and the biggest question facing this team has yet to be answered. Who will be the starting quarterback? Trevor Siemian is the returning starter, and based on his experience he might be considered to be the favorite. However, a strong showing by Paxton Lynch in minicamp, seems to have evened up the race. Lynch is the big-armed, second-year player out of Memphis, and he seems to be set on earning the starting spot. With training camp opening in about one month, can Siemian return to the form that won him the job just one year ago? Don’t count out the former Northwestern Wildcat just yet. It was just last season that the Broncos were on the hunt for their new signal caller. With Peyton Manning retiring, a trade was made for backup Philadelphia Eagles quarterback Mark Sanchez. The prevailing thought was that Sanchez would be the temporary starter until Lynch was ready to take the reins. Yet, in the preseason, Sanchez’s turnover proclivity would doom his chances with the coaching staff. Lynch, meanwhile, still seemed a bit overwhelmed with his jump to the NFL. His inexperience in the pocket was apparent, and he was sacked seven times in limited preseason playing time. The opening day starter would end up being the least-known, or at least least-hyped, passer of the bunch. Siemian won the job outright, but as the Broncos offense struggled down the stretch, he wasn’t the most popular choice among many fans. The Denver offense faltered down the stretch, and many felt it was Siemian’s inability to make big plays that was to blame. The Broncos averaged just 6.9 yards per pass, ranking them among the league’s worst passing offenses. Was it a result of the terrible offensive line that allowed 40 sacks? Did the lack of a running game hurt their ability to stretch the field? Was it just that Siemian was in over his head as the starting quarterback? It may have been something else entirely. The Broncos opened the 2016 season with a comeback victory over the Carolina Panthers by scoring 14 fourth-quarter points. Siemian was hardly spectacular, throwing for 178 yards, one touchdown, and two interceptions. Yet, the Denver defense knocked Cam Newton around, running back C.J. Anderson rushed for nearly 100 yards, and the Broncos managed to escape with a close win. In Week 2 against Indianapolis, Siemian looked to be more confident, despite the fact that he was sacked five times. He threw for 266 yards, and averaged over eight yards per pass as the Broncos beat the Colts 34-20 at home. Siemian looked to be on top of his game in Week 3. He went 23-for-35 for 312 yards, with four touchdowns, against a talented Cincinnati defense. Siemian was getting better, the offensive line allowed him to be sacked only twice, and the Broncos were undefeated. However, a trip to Tampa would change everything drastically. In Week 4, the undefeated Broncos went to west Florida to face the 1-3 Buccaneers. There, the season took a turn for the worse. Late in the first half, the Broncos held a 14-7 lead, and Siemian was off to a good start. He was 5-for-7 with 68 yards and a touchdown to Demaryius Thomas. But on a second-quarter drive, Siemian was slammed to the turf, injuring his non-throwing shoulder. He would miss the remainder of the game, as well the following week, a home loss to the Atlanta Falcons. 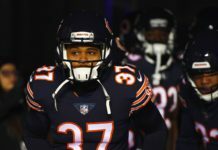 He returned for a Thursday night divisional matchup against San Diego in Week 6, but was largely ineffective, and the Broncos stumbled to another loss. His failed Hail Mary pass in the game’s final moments, a throw that did not even reach the end zone, became a focal point all season for the Siemian detractors. Then, in Week 7 against Houston, the Broncos played some of their best football of the season. 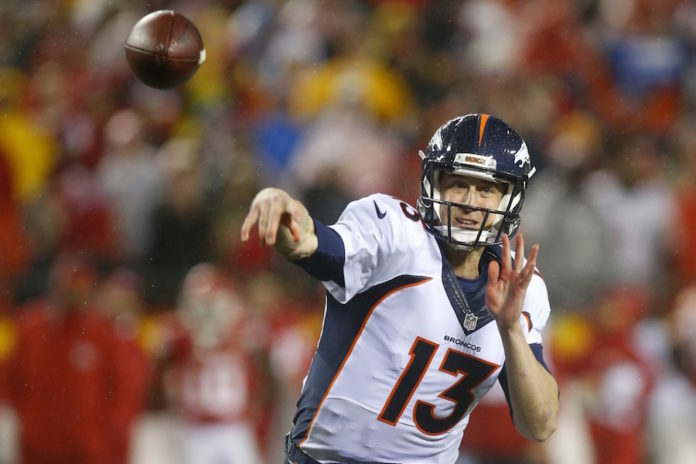 Siemian was still less than 100 percent, but Anderson exploded for over 100 yards, and the offense was clicking again. They tallied 347 yards, and blew out the playoff-bound Texans 27-9. Unfortunately, Anderson was lost for the season with a knee injury, and the Broncos would never recover. The threat of a running game forced opposing defenses to play honestly. Without that, Broncos’ opponents simply ran roughshod over Denver’s struggling offensive line, and attacked their still damaged quarterback. 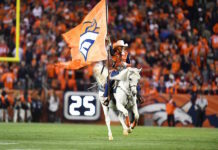 After starting off 6-2, they would lose five of their final eight games, and those injuries to Siemian and Anderson proved to be too much to overcome. Last season, we saw flashes that Trevor Siemian could end up being the next dependable Denver Broncos quarterback. No, he isn’t the biggest, or the fastest quarterback, and he certainly doesn’t have the arm strength of Paxton Lynch. Yet, he does possess many qualities that this new coaching staff is looking for in their quarterback. He seems to be a quick study, and that should help him pick up Mike McCoy’s new offensive scheme. He is cool under pressure, which should be valuable, as this team may have to find a way to grind out some very tough wins with a challenging schedule. Like last season, many are expecting Siemian to just get out of the way and relinquish his starting position to the more talented Lynch. And like last season, Trevor Siemian just might battle his way to another win for the Broncos’ starting quarterback position.